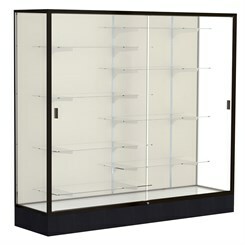 If you require ample room for a large display then the Colossus Series is the trophy case for you. Aluminum framing secures the sliding tempered glass doors and incorporates a built-in lock. Includes eight 14" deep half-length shelves with brackets. 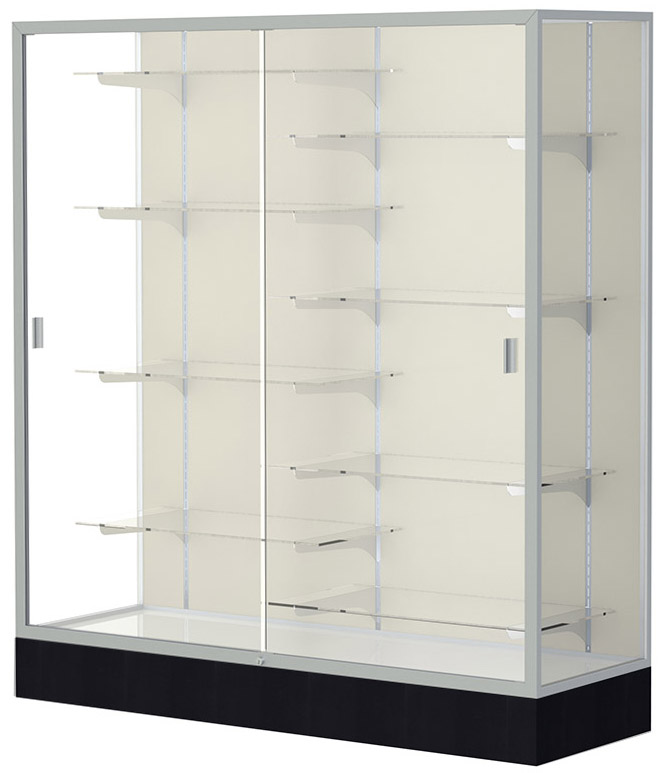 These large aluminum floor cases offer such premium features as steel shelving hardware and built-in floor levelers. 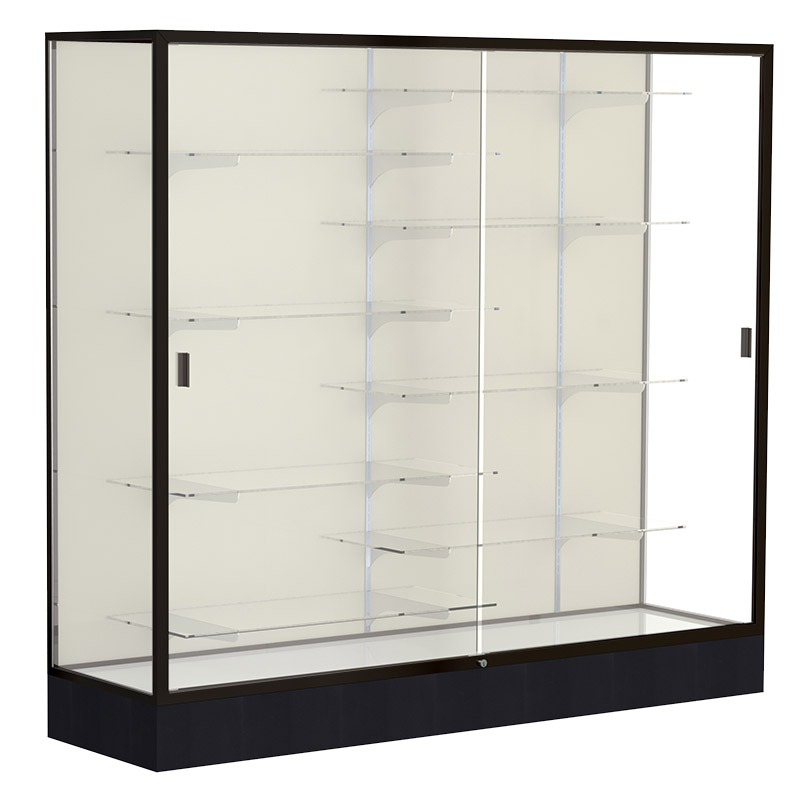 Colossus Series' reduced 6" black accent base helps to maximize the available display area. Choice of three frame finishes and two backgrounds - either a bright white laminate or a tackable plaque background for displaying your prized plaques or other objects (nylon loop tape with velcro tape included to attach to plaques). With the Colossus Series there is room to celebrate today's moments as well as your future conquests. Our 60" wide Colossus case is sold above. Measures 60"W x 20"D x 66"H overall. Ships fully assembled. Shipping weight 392 lbs. PRICE INCLUDES SHIPPING! (Truck shipment - see Terms & Conditions.) Please allow 3-4 weeks for delivery. 72"W Colossus Display Case is perfect for any business or school with multiple awards. Extra wide interior gives your mementos plenty of room. Aluminum frame with tempered glass. Front sliding doors include lock. Black pedestal base. Measures 72"W x 20"D x 66"H overall. Ships fully assembled. Shipping weight 465 lbs. PRICE INCLUDES SHIPPING! (Truck shipment - see Terms & Conditions).